No one ever said saying goodbye was easy. Just ask the characters in Eric Gilde’s grief play the goodbye room. Following the death of her mother, a woman finds herself back home picking up the pieces of a shattered family while facing the demons of her past. 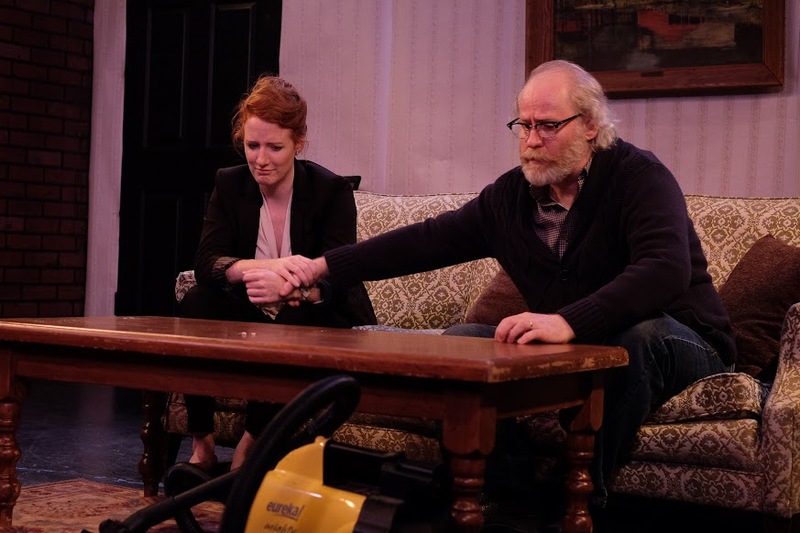 Presented by Happy Few Theatre Co., the goodbye room explores the world of grief through a healing few rounds of the blame game. Written and directed by Eric Gilde, the goodbye room brings Bex, the oldest daughter, home to Minnesota where she must help her sister and father prepare for the funeral of her mother. As we learn about the facts surrounding the death, a single tragedy forces reconciliation through memory of the happier times. With a floor full of eggshells, the characters must navigate through the past to forge a hopeful future. Gilde's script is brimming with sentiment. Whether you've experienced loss before, the connections created through his characters ring true. But with a piece where the characters are forced to rehash the past and dig up the forgotten, it causes repetition and an inability to grow and move on. For the most part, remembering was an inactive action for the characters. It rarely fueled their fire. Paring down these moments will allow the piece to continually move forward because when there is present action, it's stunning. While the piece could use some streamlining and compacting the repetitive beats, finding a way to have the characters grow together through the past could be beneficial. We see a glimmer of that through the late night sister bonding session, so Gilde is on the right track. Aside from the family, Gilde introduces a family friend in Sebastian. We learn that Sebastian was a source of crushing for Maggie and there is infinite romantic tension between Sebastian and Bex. Sebastian is a defining character in the course in the story. The will they-won’t they element between Bex and Sebastian is nice to watch, but when Bex finally makes her decision, you end up a little baffled. Is it the right choice? But the most interesting element of the Sebastian story is his big secret he reveals to Edgar. While it’s a severely contrived moment that allows Sebastian and Edgar to be alone but the severity of Sebastian’s not telling Edgar of his late wife’s dizzy spell sadly feels a little minimal in the stakes game. Perhaps beefing up what the secret is or what her accident is will heighten the stakes that do need to be amped up. But these tiny moments could be explored with a separate set of eyes in the directing chair asking the important questions. The quartet of actors did a nice job avoiding a ninety minute heavy woe-is-me fest. As Bex, Ellen Adair had a heightened aura bout her. She has a whimsical allure that occasionally gets in the way of Gilde’s modern text. As her high-strung sister Maggie, Sarah Killough was flailing about with her intentions. While the event was surely traumatic for Maggie, Killough did play the victim in nearly every situation, which could be a form of grief. We learn that there is a giant wedge between Bex and Maggie. It explains the rigidity in many of the early scenes. But when their inhibitions are down and Bex and Maggie are sisters again, it displayed Adair and Killough’s finest moments on stage. Michael Selkirk played into the lost soul element of Edgar. While he didn’t appear as much as the others, Selkirk made his moments last. The strongest performance though was Craig Wesley Divino as Sebastian. He was simply fantastic. There was a natural ease to his performance that made him alluring. With the exploration of the blame game being a strong theme in the goodbye room, Eric Gilde did a fine job guiding his company. Despite having a tight space to play with, it never felt cumbersome. Scenic designer Justin Spurtz did a great job curating the space to create a living room stuck in the past. Though the wallpaper wasn’t perfectly applied, it did help transform The Bridge. Sound designer Jacob Subotnick brought sound isolation to the production which allowed the play to live in the proper world. Moving forward, Gilde really could benefit from a fresh set of eyes to steer the piece to the next level. the goodbye room doesn’t present anything new but it is an accessible story.